A Single Man, Tom Ford's directorial debut, has won the Queer Lion award at the Venice International Film Festival. Ford competed against fourteen other films to win the third annual prize for gay-themed films screened at the festival. 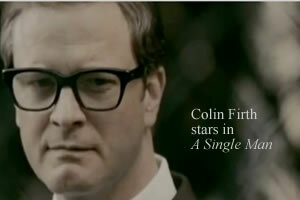 A Single Man was the last of 25 films to screen in competition for the festival's top prize, the Golden Lion. It is the only gay-themed film in competition for the main prize. The big screen adaption of Christopher Isherwood's 1964 novel of the same name, stars Colin Firth, Julianne Moore and Matthew Goode. Isherwood's novel centers on college professor George (played by Firth) as he struggles on after the sudden loss of his partner, Jim (played by Goode). George is the ultimate outsider in 1960s Los Angeles: middle-aged, gay and British. “The story is a romantic tale of love interrupted, the isolation that is an inherent part of the human condition, and ultimately the importance of the seemingly smaller moments in life,” Fade to Black, Ford's production company, said in a statement. Directors Gustav Hofer and Luca Ragazzi presided over the Queer Lion award jury panel. The couple's documentary on gay marriage in Italy Suddenly Last Winter won a Panorama special mention at last year's Berlin Film Festival. Gay Entertainment Report is a feature of On Top Magazine and can be reached at ontopmag@ontopmag.com.